Lydia Mendoza (May 21, 1916 ? December 20, 2007) was an American guitarist and singer of tejano music. She is considered by many "the queen of Tejano music". She is also known as La Alondra de la Frontera (The Lark of the Border). Mendoza was born into a musical family in Houston, Texas. She learned to sing and play stringed instruments from her mother and grandmother. In 1928, as part of the family group Cuarteto Carta Blanca, she made her first recordings for the OKeh company in San Antonio. In the early thirties, Mendoza came to the attention of Manuel J.
Mendoza was born into a musical family in Houston, Texas. She learned to sing and play stringed instruments from her mother and grandmother. 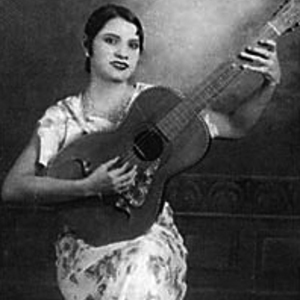 In 1928, as part of the family group Cuarteto Carta Blanca, she made her first recordings for the OKeh company in San Antonio. In the early thirties, Mendoza came to the attention of Manuel J. Cortez, a pioneer of Mexican-American radio broadcasting. Her live radio performances set the stage for her recordings for the Blue Bird label in 1934. One of her recordings, "Mal Hombre", became an overnight success, and led to an intensive schedule of touring and recording. After World War II, Mendoza recorded for all the major Mexican-American record labels. One of the relatively few songs she personally wrote, and a personal favorite, was "Amor Bonito", dedicated to her husband. Lydia Mendoza continued performing and recording until slowed by a stroke in 1988. In 1982, she became the first Texan to receive a National Endowment for the Arts National Heritage Fellowship. In 1999, she was awarded the National Medal of Arts. La Alondra De La Frontera: Live!